Do you publicly acknowledge Jesus before others? Sometimes we are reluctant to do this, for a variety of reasons. We may not feel it is our place. We may not want to experience the backlash of criticism that may come with it. We may not know exactly how to acknowledge Him. We may even face more significant consequences or even persecution for witnessing about Jesus. 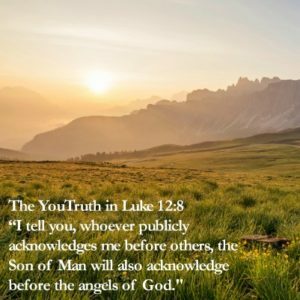 When Jesus was teaching His disciples in this passage, they would likely face severe penalties and they could even face death if they acknowledged Him publicly. Why would he teach, both then and now, that we should be willing to subject ourselves to this kind of unpleasantry? Because Jesus is up to it. 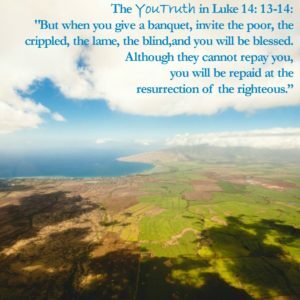 You see, Jesus is the one being attacked when skeptics reject our testimony. Jesus is the one being scorned when we acknowledge Him as our Lord. And He is up to it. If we know Jesus as our Lord and Savior, we know He has already died for us and saved us for all eternity. Skeptics and critics, atheists and even aggressive objectors can’t kill Him (again) and take that away from us. No matter how hard they try or how convinced they are that we are crazy for believing in Him, He died for us. It’s done. We are eternally saved. So we can boldly proclaim Him, in love, whenever the opportunity presents itself. And we can know that He is already proclaiming us before the angels of God.